Happy Birthday Ovyda. I hope you enjoyed it my friend. You really should stop by to check this place out more often in your free time, unless you want people to forget to wish you a happy birthday. Thought I'd drop in to let you know the Second Season to Showa Genroku Rakugo will premiere in January. I'm so fortunate because that falls on the same month as my birthday. I'd call that good karma and fortune lol. I've now seen 121 eps of Prince of Tennis, and while I enjoy parts of it the show as a whole is a little harder for me to watch now. Not that it is bad by any means but I grow bored of watching the cast play tennis in tournaments. I actually preferred watching them play bowling and billiards, I even enjoyed their training camp that occurred after their matches against Rikkaidai was postponed. They can be but I find how Ryoma just levels up mid battle to get boring. I barely even like him, my favourites are Kikumaru, Momoshiro and Fuji, hell even both of the girls rank higher than Echizen. Well if you had talked big about Major in the past instead of Prince of Tennis I may have watched it instead. Although it was actually between those two when I started this one. Major is definitely better. Great story and character development without going out of common sense abilities. The series cover MC's whole career starting from age 5 up to till he retires and creates a family. Supetb series with many feels moments. Fuji is pretty likeable so I can see why he's your favourite. To me he doesn't have enough personality to be the best character though. I had no idea that Major was like that, I wish you had talked this one up more so in the past now. I'm finding it a bit hard to finish Prince of Tennis. I like it but I watched 8 eps today and was pretty damn bored afterward. Hewoo! I was wondering if your avatar picture came from an Anime series? Hi. 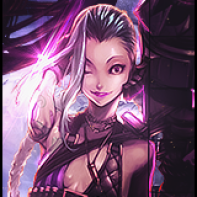 It's Jinx from a game called League of Legends. Thought I'd mention it here since it was important to you in the past, I finally began Prince of Tennis. So far it is good, I'm enjoying it but I'm not finding it amazing just yet. I'll have to report back later when I get through more eps. This will take me some time. As of now I've seen 14 and the recap special ep that comes in after ep 12. Ryoma is one bad arse 12 year old, I think that was what they said his age currently was. hard to believe but I'm okay with that. Still a good fun watch. Still enjoying Prince of Tennis, I've now watched 53 episodes but I'm still only rating it a 7. I've almost made it a third of the way, but I'm wondering when a match will occur that completely gets me hyped to continue watching. Wandering around once in a while. Hey Ovyda, I noticed your sig is from Kuroko no Basket. Is that a still from the manga or something? I never saw him playing in the Kuroko no Basket anime series and though I might have missed a few episodes or something.